First it will ask for your name, enter the name you want to appear on all emails you send out then press the Next button. Next it enter your NETPLEX email address, username@netplex.net, press the Next button. Now it will ask for some server settings. In this window, make sure POP3 is selected as the mail server type. In the Incoming mail server, enter mail.netplex.net and in the Outgoing mail server enter in mail.netplex.net. Now press the Next button. In the next page, you need to enter your NETPLEX username and password. 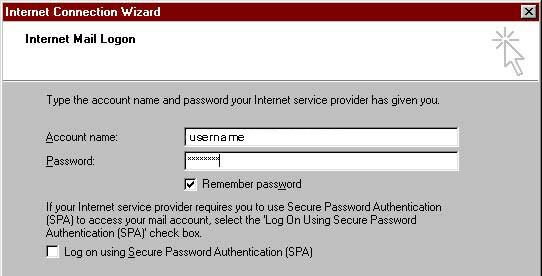 If you want Outlook 2000 to remember your password so you don't have to type it each time to get your mail, check the box labeled Remember Password. Once this is setup, press the Next button. 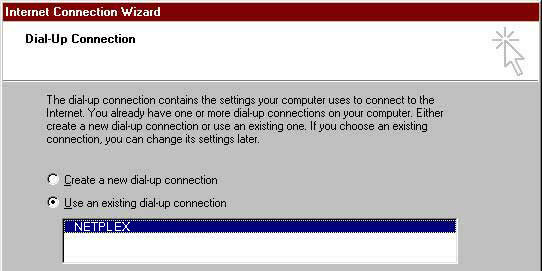 You want to select to use your NETPLEX connection, so choose Use an existing dial-up connection and select your NETPLEX connection. Press the Next button. Now simply press the Finish button and Outlook 2000 is all setup for use!